Despite being an important tourist centre, Palampur, which is also known as tea town of the state, is crying for the immediate attention of the authorities concerned. Himachal Pradesh has invited investments in the private sector to develop apple production, the mainstay of the state’s fruit economy, Chief Minister Prem Kumar Dhumal said recently. The fast-changing system of education with the global information technology revolution needs a blend of Indian culture and civilisation. To exclude inhabited areas falling under the Kugti Wildlife Sanctuary in the Bharmour tribal region of Chamba district, a meeting chaired by Deputy Commissioner (DC) Sharabh Negi was held at Kharamukh recently. The district unit of the Rajput Kalyan Sabha here has criticised caste-based reservation and demanded that the practice be stopped immediately. Vishal Jagota, member, state executive, Himachal Pradesh State Cricket Association (HPCA), and Keshvender Singh, state vice-president, HPCA, accompanied by 12 state and district office-bearers of the association have rejected the charges of Vikramaditya Singh, son of Central Minister Virbhadra Singh, and said no outside players were playing in the HP cricket team who were not allowed under the BCCI rules. 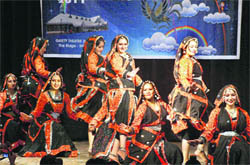 The function organised on 34th raising day at Sainik School, Sujanpur Tira, was unique in many ways as several enchanting programmes were organised on the occasion. The proposed 4.9-km Holi-Utrala tunnel connecting Baijnath in Kangra district with the Bharmour tribal township in Chamba district will be constructed underneath the Jalsu Jot, which will ensure an all-weather route linking the Bharmour area of Chamba district with the Pathankot-Manali National Highway-20 at Baijnath. With a view to spreading awareness about filling of quarterly e-TDS Income-tax returns and certain amendments enacted in the provisions of Tax Deduction at Source, a workshop was organised today by the Income Tax Department (TDS wing), Chandigarh, here in the HPAU Conference Hall. Superintendent of Police Santosh Patial has asked all those residents who have kept any tenants in their houses to report about them to the local police station, including their identification and birth place along with a photograph for future reference in case of any need. 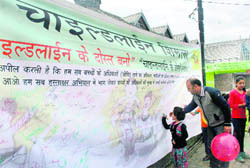 In an effort to create awareness about the children’s rights, particularly against the child labour, a non-government organisation Childline Shimla, organised a “Childline Dosti Week” in the state capital from November 8 to 14. Members of the organisation formed teams which interacted with taxi drivers, bus drivers and conductors, traffic police, migrant labourers, shopkeepers, officials and other sections and apprised them about the NGO. “Suraksha Bandhan” bands were given to the policemen, taxi drivers, students, tourists and residents of the city. I am a regular visitor of Nahan. This time my visit was after a gap of three years. As my vehicle was going up the Shimla road, I saw Dr YS Parmar’s statue on my right (see photo). It was inaugurated by the then Chief Minister in November 2010. As the name of the sculpture is missing from the plaque, I had to do little effort to find it out. I was told that it was sculpted by Naresh Verma of Gurgaon, the man who did 108-feet tall idol of Hanuman at Jakhu in Shimla. But he who shaped Hanuman at Shimla was Naresh Kumar of Pilani (Rajasthan). I am leaving it to the reader to find out Who’s Who. The statue at Nahan has been installed by the Rajput Sabha whose president is Dinesh Chaudhury. The Rajput Sabha has spent Rs 8.5 lakh in developing the site inclusive of the cost of Rs 2.9 lakh for sculpting it. Palampur means a land of brave soldiers who have laid down their lives for the unity and integrity of the country in various wars which were fought before and after Independence. Capt Vikram Batra, (PVC), Major Som Nath Sharma, (PVC), and Major Sudhir Walia (Ashok Chakra), are some of the martyrs of the town who have sacrificed their lives in the recent wars. However, the governments, who have ruled the state, have failed to recognise their supreme sacrifices and extended step-motherly treatment to the town. The state government even failed to accord district status to this town. Today, people here are devoid of all the basic amenities and they are living in poor condition. Potholed roads, overflowing drains and contaminated drinking water tell the tale of the town, which is fast turning into a big slum. Despite the fact that there has been a manifold increase in the population, the state government has failed to extend the municipal limits of the town. At present, only 10 per cent area of the town, having a population of 4,000, falls in the municipal limits. Over 45,000 people live outside the municipal limits. In fact, the town has become the victim of dirty politics. Even in the municipal areas, the situation is no better. No one in the Municipal Council is bothered about improving the things which are going from bad to worse day by day. Almost all the interior streets are in a bad shape. Due to the overflowing of drains in the rainy season, water accumulates in the streets making it difficult for the residents to move around. Roads and streets dug up for laying water supply line and phone cables are yet to be repaired. The busy roads leading to Lohana Colony, Ram Chowk, Cinema Road and inter-state bus terminal are in the worst condition. The road dug up for laying pipes a year ago has not been repaired by the authorities yet. Heaps of garbage emitting foul smell can be seen in every nook and corner of the town. In many areas, garbage is not removed for days together. The situation in internal parts of the town is no better as the panchayats have no resources to maintain cleanliness, resulting in huge garbage dumps on the roadside at Ghuggar, Sugar, Aima, Bundla and Chokki Khalet. The unplanned and haphazard construction of housing colonies in the town has become quite common. Since all these colonies have been coming up in the panchayat areas, they lack all basic amenities like, streetlights, roads, sewerage and drinking water supply. In the absence of any appropriate authority to deal with the planning of the town, there has been mushroom growth of colonies. Although the state government has brought this town under the purview of the HP Town and Country Planning Act, it too has failed to improve the situation. A number of houses, sheds and shops in the town have come up without the prior approval of the Town and Country Planning Department. Stray animals cause a lot of inconvenience to the general public here. Pigs and other stray animals can be seen roaming in the town. These animals feed on heaps of garbage in different parts of the town. The complaints made to the local administration, particularly the municipal authorities, have yielded no fruitful results. No efforts have been made to impound the animals. Panchayat areas like Ghuggar, Sughar, Aima, Choki, Bindravan and Bundla are in bad shape. Ninty per cent population of the town resides in these areas. No funds are provided to the panchayats for the development of these areas. Even, the panchayats have no means to remove garbage dumps. “We will welcome investments in the private sector for developing apple nurseries to multiply imported rootstock to increase its yield,” Dhumal told officials of Dev Bhumi Cold Chain Ltd. He said the government was also keen to associate private sector in creating quality cold chain infrastructure to store apples. Dhumal said per hectare yield of apple in the state ranged between five and seven metric tonnes (MT) compared to 50 to 60 MT in European countries. “The state is implementing apple re-plantation scheme at a cost of Rs 85 crore to replace the old rootstock with high-yielding varieties,” he said. Dev Bhumi chairman and managing director Sanjay Aggarwal said the company was planning to invest Rs 100 crore in the creation of cold chains and apple nurseries in the state. Himachal Pradesh is one of India’s major apple-producing regions, with more than 2,00,000 families engaged in the cultivation of the fruit. Due to unfavourable weather, the total output of apples this year was around 1.40 crore boxes of 20 kg each, 69 per cent less than the last year’s bumper production of 4.46 crore boxes. The previous record yield of 2.6 crore boxes was in 2007 which slipped to 1.4 crore boxes in 2009. In 1999, the state recorded a production of 98 lakh crates, the lowest in the past 12 years. To instill the traits of the culture, the teaching community should put all-out efforts in nourishing the nursery of children thereby giving a direction for a bright future to society and the nation. This was stated by Chamba Deputy Commissioner Sharabh Negi while presiding over an annual prize distribution function of DAV Senior Secondary School, Chamba, held at the local Durbar Hall recently. The DC advised parents that it was only fewer comforts given to a child that would enable him to be practical, gaining more during schooling. He observed that the comforts given lavishly to a child hindered his learning capacity. The DC asked teachers to continue their endeavours in improving the standard of education. Reading out the annual report of the school, Principal AK Guleria said there were 1,251 students on the rolls of the school. He said the school management had drawn the Rs 2.50-crore project for the construction of an additional building. Earlier, DAV’s local managing committee vice-president KK Mahajan, retired engineer-in-chief of the Himachal Pradesh Irrigation and Public Health Department, presented a memento to the DC who was the chief guest on the occasion. The purpose of the meeting was to listen to the claims and objections of residents of the inhabited areas covered under the sanctuary so that the proposal could be submitted to the Standing Committee of the National Board for Wild Life (NBWL) of the Union Ministry of Environment and Forests for rationalisation of the sanctuary. Thereafter, the committee would recommend the proposals with certain modifications to the Central Empowerment Committee (CEC) constituted by the Supreme Court of India for the final clearance. It was revealed in the meeting that along with the villages of Lower Kugti and Upper Kugti, demarcated protected forest areas of Drati, Dharol, Boru, Thentho, Buar and Keylong were also proposed to be brought out of the jurisdiction of the forest Act with a view to excluding these areas from the sanctuary. Simultaneously, an equal portion as compared to the excluded area would also be included in the sanctuary area. The residents of these areas said they had no objection in excluding the proposed areas were satisfied. After the final clearance to the rationalisation of the sanctuary with certain modifications by the CEC, the riparian rights of local residents would be restored, Divisional Forest Officer (Wildlife) Surjit Kumar Mehra stated. An unanimous resolution was adopted at a largely attended meeting held at Auhar, near here, recently, which was presided by president of the sabha Prem Lal Thakur. Sabha general secretary Yogesh Thakur and press secretary Hukam Singh Thakur said here recently that the meeting demanded that all reservations be based on the economic condition of a family without caste-based considerations. The sabha was categorical that instead of removing the caste system and poverty among the Scheduled Castes and other such reserved categories, this practice had perpetuated the caste system indefinitely and hardly a few deserving families had been able to get desired benefit out of it as every time the same families had been repeatedly taking its advantage. Prominent Rajput leaders of the area who spoke included Subedar Dhani Ram Thakur, Sunka Ram Thakur, Vinod Thakur and Prakash Chand Chandel. He said barring three players, all other players belonged to the state and were selected on the basis of pure merit for ensuring better performances even in national matches. Talking to mediapersons at the Bilaspur Cricket Stadium here recently, the duo said Anurag Thakur, HPCA state president, who is now the joint secretary of the BCCI, was the first person to make efforts to construct an international-level cricket stadium and a multi-sports complex at the Annadale ground in Shimla, but the armed forces resisted the move. They said Vikramaditya should persuade his father Virbhadra Singh to take up the matter with the Centre and give the Annadale ground, the only place available in Shimla, for the purpose to the HPCA. The HPCA was prepared to spend Rs 100 to 200 crore on developing this ground into an international cricket stadium along with a multi-sports complex there. They said Anurag had recently inaugurated an indoor and outdoor cricket academy at Lalpani at Shimla and declared that it would become functional within the next six months. Jagota and Keshvender said there were firm plans to develop cricket stadiums at Chopal and Gumma, apart from developing at least one stadium in every district. They said the stadium at Dharamsala was developed only after the HPCA failed to get Annadale at Shimla. They said not only in cricket, but Anurag was also interested in developing multi-sports complexes at all the cricket stadiums and such facilities had already been provided at several stadiums, including Nadaun. The HPCA was also helping in appointing 30 to 40 coaches in other sports within the next few weeks. The programme began with stilt exercises performed by school students. It was a rare sight to see a troupe of students walking and exercising on the stilts. The troupe not only gave a salute in the march past to the chief guest but also performed difficult exercises in complete harmony. The gymnastics exercises performed by the students on pole volte were performed maintaining balance jumping through fire circle. While displaying Karate skills, the students showcased precision and strength in breaking cement tiles with hands, elbows and heads. Similarly, display of school band was also in complete harmony and in perfect rhythm with participating students playing excellent tunes on flutes, bugles and drums. 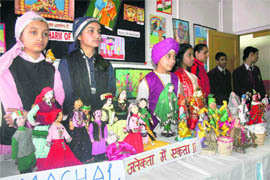 The students had displayed working models in arts and science exhibition on the occasion. A defence exhibition was organised for the first time in the school. Through the exhibition, the 39 Mountain Artillery Brigade had displayed a radio set used by the Army for the communication, GPA antenna having 25-km range, command post controlling battery of 6 guns, various guns and mortars, a surveillance equipment TIIOE and anti-tank guided missiles among other equipments used by the Army. Ravi House of the school won the Major Sudhir Walia Trophy for its performance in academics and tertiary activities. Cadet Aamardeep was awarded the best cadet trophy for his achievements in the field of academics, discipline and co-curricular activities. Himachal Pradesh Vidhan Sabha Speaker Tulsi Ram stated this while dedicating a building of an ayurvedic sub-centre at Nayagran to inhabitants of a remote tribal terrain of the Bharmour Assembly constituency recently. The building was constructed with an estimated cost of Rs 27 lakh, which would prove to be a boon to the ailing people at their doorstep. He also inaugurated a Rs 14-lakh forest rest house at Nayagran. The Speaker said the work to prepare a draft project report (DPR) for the construction of the Holi-Utrala tunnel was in the pipeline while the pre-feasibility report of the tunnel had already been prepared by the survey and investigation wing of the Himachal Pradesh State Electricity Board. The Speaker said the proposed tunnel would be constructed with a notional cost of Rs 145.74 crore. Officials were on the job acquiring speedy forest related clearance so that the construction work on the tunnel could be undertaken by next year. Upon completion, the tunnel would facilitate pilgrims thronging to the famous Manimahesh pilgrimage, which generally numbered to over five lakh every year, besides encouraging tourism to the valley of the Bharmour region in Chamba district, the speaker said, adding that it would generate vast employment opportunities in the region. HC Negi, Income Tax Commissioner (TDS), Chandigarh, said at present over 40 per cent tax collection was coming through the TDS in the country. In the North-West region, the figure was 52 per cent. Central Board of Direct Taxes (CBDT) was committed to implement the provisions of the TDS effectively so that tax collection could go up through the TDS, which is the cheapest mean to collect the direct taxes. He said online filing of TDS returns had been made more simple by the department and latest softwares were introduced for the benefit of tax-deductor and tax payers. He quoted that in the USA and the UK, over 80 per cent of tax revenue was generated through the TDS and the Government of India was also making efforts to achieve the figures in coming years. He appealed to the bankers and other corporate deductors to extend their cooperation to the Income tax department and deduct the tax as per provisions of the law. He appealed to drawing disbursing officials attending the workshop for correct filing of data, proper quoting of the PAN in their quarterly returns and quoting of correct BSR code of the bank where tax was deposited. This could result in early payments of refunds and proper credit of tax. Joint commissioner of Income Tax RC Beakta, while addressing the workshop, said the department was always available for the help of tax payers. They could seek necessary guidance from the ITO TDS at Palampur, Una, Dharmshala and Nurpur. Sandeep Kakkar, a tax expert interacted with a number of Drawing & Disbursing Officers (DDOs) of the state government/ banks/PSUs/companies and made them conversant with the new amendments in the TDS law and also the precautions to be followed by the DDOs while filing e-TDS income tax returns. Procedures regarding correct deposit of the TDS were discussed so that the tax payers could get proper online credit. An order issued here recently and applicable for the entire district has stated that all those who have kept any servant or domestic help, this information should be given to the local police station with all details and his or her photograph. Patial said this was essential for safety of citizens to avoid any future complications as there had been cases where lack of any such information had cost dear to the house owner. The district police has already made it mandatory for every outside labourer or any individual who has come here for employment or is self-employed, to get himself identified at the police station near his residence and carry an identity card with him. The SP has warned of action against those who would not follow this order and would not cooperate in this matter. In an effort to create awareness about the children’s rights, particularly against the child labour, a non-government organisation Childline Shimla, organised a “Childline Dosti Week” in the state capital from November 8 to 14. Members of the organisation formed teams which interacted with taxi drivers, bus drivers and conductors, traffic police, migrant labourers, shopkeepers, officials and other sections and apprised them about the NGO. “Suraksha Bandhan” bands were given to the policemen, taxi drivers, students, tourists and residents of the city. The NGO has been pursuing campaign against child labour and it has been instrumental in rescuing many children, who were being exploited at ‘dhabas’, hotels and other commercial establishments. A signature campaign was also launched (see photo) to involve maximum number of people in the campaign for the children’s rights. The signatories were urged to take pledge to protect the children’s rights. On the final day of the campaign, a painting competition was organised in association with the Himachal Pradesh Voluntary Health Organisation and it concluded with a rally. A Shimla-based NGO Ashadeep organised a programme at the local RKMV College to create awareness about eye donation in collaboration with the Youth Wing of the Red Cross recently. The main objective to start the awareness campaign from a women educational institution was to tap the potential of girls for bringing about social change. They can play a pro-active role as agents for promoting and motivating people for eye donation, said Sushil Tanwar, president of the Ashadeep. A team of doctors from the eye bank of Indira Gandhi Medical College assisted in sensitising the students about the growing demand of cornea transplant across the state. Associate Professor Dr Ram Lal Sharma spoke about two types of eye donations, voluntary and motivational, which could be made on the will of relatives of the deceased. He said there were 10 million cases of corneal blindness worldwide, of which one million were children, and on an average the state needed 4,000 to 5,000 corneal grafting. Ninety per cent of eye donations in India came through voluntary aged donors and only 30 to 40 per cent were used for transplant owing to the quality of the cornea. Principal of the college Naresh Mahajan lauded Ashadeep’s initiative for the noble cause and assured all help in such endeavours. He called upon the students and the teaching faculty to support their will for voluntary eye donation. The dominance of sons of established leaders and role of money in the recently concluded organisational polls to elect the state president of the Youth Congress has left behind a clear message that despite introduction of democratic process, such posts will be beyond the reach of grassroot-level workers. The entire exercise had made it clear that the idea of Congress General Secretary Rahul Gandhi to promote party workers in the party organisation was not workable and in fact it had got defeated. The way Congress leaders pitched for their sons from booth level to top positions and tried to get them elected to various key posts, it seemed clear that all leaders are keen to continue their legacy in politics through the generation next. At every level, with a few exceptions, children of former ministers, MLAs and other leaders have been indeed elected to different organisational posts. While it was a contest between Vikramaditya Singh, son of Union Cabinet Minister Virbhardra Singh, and Raghubir Bali, son of former minister GS Bali, for the state president; sons of former ministers Ram Lal Thakur, Tek Chand Dogra and some other leaders were also in the fray for other posts. While the common worker is fuming over the dominance of ‘pariwarvad’ in politics, the talks of providing opportunity to the party men by conducting impartial organisational polls is turning out to be a mere rhetoric. If the credit of bringing Himachal Pradesh as a state on India’s map goes to anybody, then he is none other than the first Chief Minister Dr YS Parmar. He was born at Chanhalag village of Sirmaur on August 4, 1906 to Bhandari Shivanand Singh and Lakshmi Devi. He completed his secondary education at Nahan, took his bachelor’s degree from FC College, Lahore, master’s from Canning College, Lucknow, and with a thesis on ‘The Himalayan Polyandry’, got a doctorate from Lucknow University. He then served as the Sub-Judge and Magistrate (First Class) at Nahan for the state of Sirmaur from 1930 to 1937 and again as District and Sessions Judge from 1937 to 1941. After that he jumped into political arena to become the first Chief Minister of Himachal Pradesh in 1952 and then continued as such for about 18 years. I give credit to Dinesh Chaudhury and his team for the statue of the person at Nahan who had spent his childhood playing football at Chaugan, his youth on the bench there delivering justice and his age in the service of the people of the state bringing glory to Nahan. I may warn that installing statues is easy but their maintenance and upkeep of the surroundings which needs constant vigil is difficult. Here lies our weakness, we create things and let it leave at God’s invisible hand for its uphold. I have seen exquisite statues installed in memory of writers and artists raised by public donations in the former USSR which were maintained by the Municipal Committees expressing gratitude to the donors who had gifted the statues to the cities. I strongly believe that here, too, such efforts by the private parties be appreciated by the municipal committees of the towns and take responsibility of their preservation. Almost all the statues in Shimla are installed by the Language and Culture Department and maintained by the municipal corporation. Such understanding is a must between the Rajput Sabha and the municipal committee of Nahan. Another addition that came to my notice was the statue of Agrasenji Maharaj. Again, I am anxious about its maintenance and have nothing more to add than that I have said before. I had a morning walk of the Villa Round and found that The Environment Society of Nahan was doing an appreciable job. The trees had ‘taulias’ and the drains were clean; the society appears to be the custodian of heritage. Yes, heritage is not only man-made, it is natural too and maintenance of natural heritage with mantra of ‘preserve the places where nature directs the ebb and flow of life’ is the job of administration in consultation with the environment societies. My round of tanks of Nahan did not make me very happy. A few years back Kalisthan was clean, it being under the nose of the Deputy Commissioner requires better attention for its regular cleanliness drive. Pucca Tank has developed into a good site with Anarkali railings on all sides but water in that tank also needs sanitation. Lieutenant George Francis White wrote in 1829: “Nahun is a chief town of a small raj, and, though diminutive, is one of the best planned and handsomest cities.” People of Nahan unite! Allow us to say the same in 2011.